Get ready for a very Northwest experience. Explore the woods and trails that meander through this amazing property that lead to a fully stocked fishing pond with it's own dock, beach area and fire pit. Different seating areas around the pond let you experience the peacefulness and beauty from all angles. Listen to the waterfall as you eat a picnic lunch nestled among the trees. In season, wild blackberries and strawberries flourish along the hillside.This romantic cottage itself features an open floor plan with comfortable living room furnishings and kitchen with open bar seating. The Master bedroom is bright and cheerful with it's queen size bed, and a nice bathroom with a shower. There is also a queen bed in the 2nd bedroom with laundry area. Enjoy the peace and quiet cuddled around the fireplace or lounge on the outside deck with a glass of wine while grilling up your fresh catch and enjoying the panoramic views. Whatever you decide to do, comfort and relaxation awaits your stay at the Forget Me Not Cottage. Perfectly positioned for any adventure on the Olympic Peninsula, the Forget Me Not is well located. Like to hike? The Dungeness Trail Head leading to the Tubal Cane Mine is about 12 miles up the road. The North Olympic Discovery Trail just 6 miles down the road for biking and jogging enthusiasts. John Wayne Marina is only 7 miles away, rent a kayak or paddle board or enjoy a meal at the Dockside Grill. Downtown Sequim offers plenty of quaint shops and restaurants and during the summer season, a wonderful Farmer's Market on Saturdays features fresh local produce and artistic wares. Explore the many Lavender farms dotted along the countryside. Local Lavender Festival is the third weekend in July every year. Beaches are within a 10 minute drive, and of course the Olympic Mountains are just a short drive away. but you may never want to leave this very magical and intimate park-like setting found at the Forget Me Not Cottage! We have stayed at numerous vacation rentals and my husband and I both agreed this was the best place we have ever had the pleasure of staying at. The owners have created an idyllic spot in the woods for a perfect getaway. The cottage was IMMACULATE, well stocked and very comfortable. The view from the deck was amazing and the pond is truly a special spot to sit and relax. The owner's home is located near enough for them to address any problems, not that I would expect any, yet far enough away for privacy. As soon as we walked into this bright and airy cottage we knew we would have a great stay. Our only regret is that it couldn't have been longer. We will definitely be staying here on our next visit to Sequim! Serene setting with a remarkable sunrise. We spent two nights at this clean, updated, well-stocked home (coffee, butter, half-half, and other necessities were waiting for us). The property has a tranquil pond with fishing rods set up for guest use. Don't miss the bench swing in the woods. The owners are on the property and were some of the kindest, most helpful people I have encountered. It was sort of like staying with family (In a good way!). We are certain to stay here again. The Forget Me Not Cottage is a wonderful place to stay if you're visiting Sequim and the Olympic Peninsula. It's quiet, impeccably maintained and comfortable; we were working in Sequim and it was a great place to come home to after a long day's labor. Dan is the perfect host...take advantage of the pond (bring a fly rod!) and the tranquility. We'll be staying here often. This place was a great place to stay. We were visiting our daughter who is going to school in Port Angeles for the first time. Got to see the herd of elk down the road! Loved going down and petting the horses and giving them some carrots. The 3 of us very much enjoyed all of the horses. We absolutely will be back to the Forget Me Not cottage. Can't say enough good things about our stay there. We highly recommend staying here, Thank you for sharing such a beautiful spot! My family and I (2 adults / 1 thirteen year old boy) absolutely LOVED this place! So quiet and peaceful, we loved every bit of the cottage and its surroundings. My son and I fished every day and caught TONS of rainbow trout. 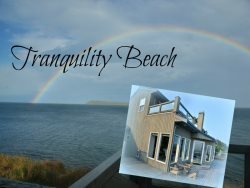 Conveniently located just close enough to town (Sequim), but not too close so you still get to enjoy the peace and quiet. Also, a really good location to call your home base if you plan on visiting the Olympic National Park and surrounding areas. Dan and Debbie were awesome hosts and we can't wait to get back to the Forget Me Not Cottage!